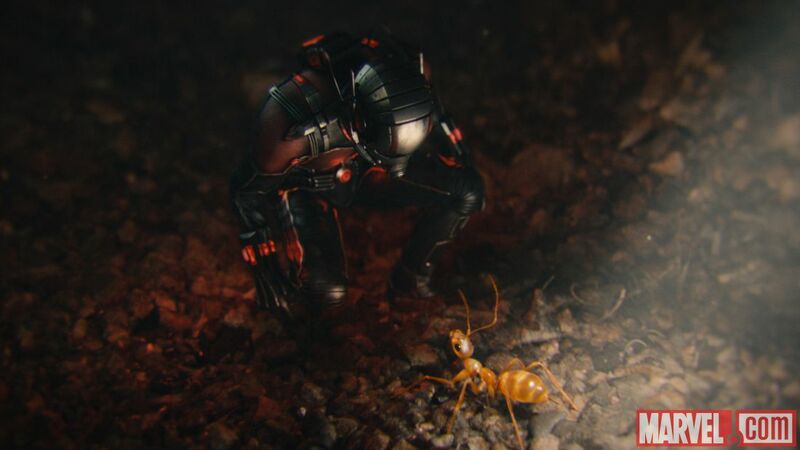 It shouldn’t be seen as a gamble for Marvel to be bringing one of the founding Avengers to the big screen, but such is the nature of Ant-Man that it is seen as exactly that. The good news is that they’ve done it again, and with some style in this very funny blockbuster. What’s It About? Ant-Man is essentially a heist movie. Scott Lang (Paul Rudd) is a cat burglar just out of prison. 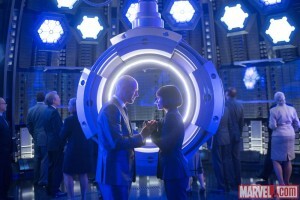 He tries to get his life back on the straight and narrow for his daughter, Cassie (Abby Ryder Fortson), but he gets hand-picked by ageing Hank Pym (Michael Douglas) to break into his former company to stop the current owner, Darren Cross (Corey Stoll), from creating his own weaponised suit. Lang and Pym team up with Pym’s daughter, Hope (Evangeline Lilly), and Lang’s friends Luis, Kurt and Dave (Michael Pena, David Dastmalchian and T.I.). Verdict: The production problems this film had are well known, leading to a fair amount of skepticism about the project as a whole, so it’s great to see they’ve made a film this good! Paul Rudd may not immediately scream ‘superhero’, but, like Chris Pratt, he suits the comedic tone here brilliantly and takes to the movie like a duck to water – and he certainly got in shape for the part too. 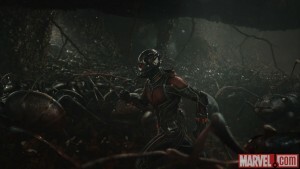 Of the previous MCU movies, tone-wise, Ant-Man’s most similar to Guardians of the Galaxy, though plot and character-wise, they’re galaxies apart. Lang provides most of the film’s wisecracks and nods to how ridiculous it all is, but the supporting cast more than pull their weight. It’s Michael Pena who actually steals the show. Luis is hilarious every time he’s on screen and he’s the real trump card in this film. Though many of the jokes may feel slightly familiar if you’ve seen the trailers or featurettes, there are still plenty more funny moments that make this movie soar high. The hand of Edgar Wright, and co-scriptwriter Joe Cornish, is definitely still visible here. As well as humour there’s actually a surprising amount of emotion for a film that doesn’t take itself too seriously. The father/daughter relationships of both Hank and Hope, and Scott and Cassie are the emotional core of the movie. The theme of ‘how far would you go to protect your daughter’ rings throughout. Lang having a daughter sets him apart from the other superheroes we’ve seen, giving him a real grounded – and relatable – cause. 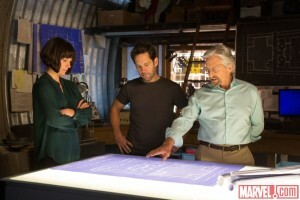 Douglas is very well cast as Pym, immediately elevating the film just by his presence. While we sense there’s more to come from Lilly’s Hope, she’s a strong female character that’s needed in Marvel movies. As always seems to be the case, we don’t see enough Judy Greer, who plays Lang’s estranged wife, Maggie. Stoll puts in a suitably cocky, angry and menacing performance as Cross; though, through no fault of Stoll’s, Cross is far from one of the most memorable Marvel villains. ‘Size-changing’ is a unique visual trick this film brings to the Marvel table, and one that helps give the film its personality. When we first get smaller with Lang, we go on a journey from a huge bathtub all the way to the street outside, and it’s truly exhilarating. People may have seen the world from a tiny point of view before, whether in Honey! I Shrunk the Kids, The Borrowers, or other films, but it’s still exciting – and this works particularly well in bringing humour to the action scenes. 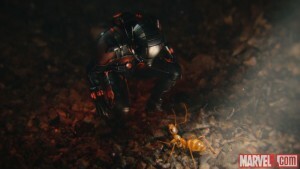 When characters are ‘ant-sized’, we flip between seeing the world as the micro-character and as a normal-sized person, and this breaks up action scenes brilliantly and hilariously at times, again emphasising the ridiculousness of the character/situation, without undermining how useful the suits can be. Though successfully telling its own story as a standalone movie, it fits in well with the wider Marvel landscape, not least because of a great Avenger cameo. They reference the events of other movies, as well as the flashback scene, which gives us some fascinating S.H.I.E.L.D. history (and lets us see some familiar faces). As always, it goes without saying that you should stick around to watch the mid and end credits scenes, especially as the two on show here feel as essential as any we’ve seen before. Final Words: This hilarious film is the perfect ‘ant’idote to the hugeness of scale in Avengers: Age of Ultron. The far tighter storyline and smaller scope see this come out as much the better movie when compared to the superhero team-up sequel. Marvel’s tiniest hero is a small triumph, with excellent performances to back up the visual thrill and sense of humour. 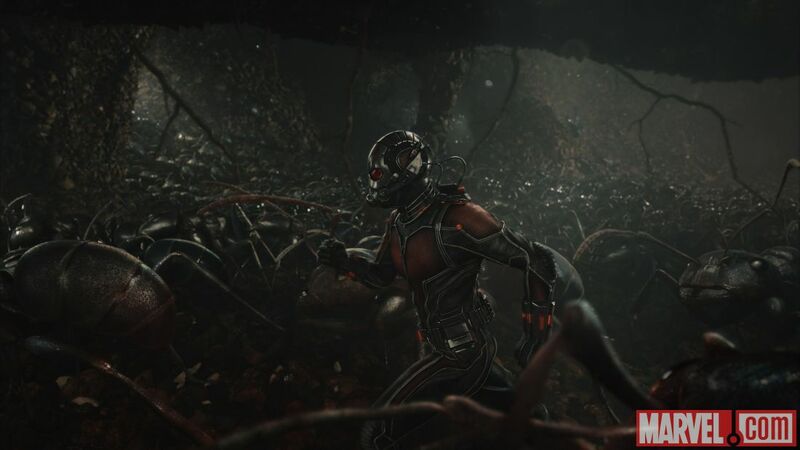 Ant-Man is released in the UK on 17th July 2015.